I’ve admired the design of Tea forte since it hit the shelves 7 years ago. Their lemongrass green label and pyramid-shaped packaging is still fresh and classy. But I had no idea just how cute it could be until a recent visit to The Royal Palm restaurant in Seattle. 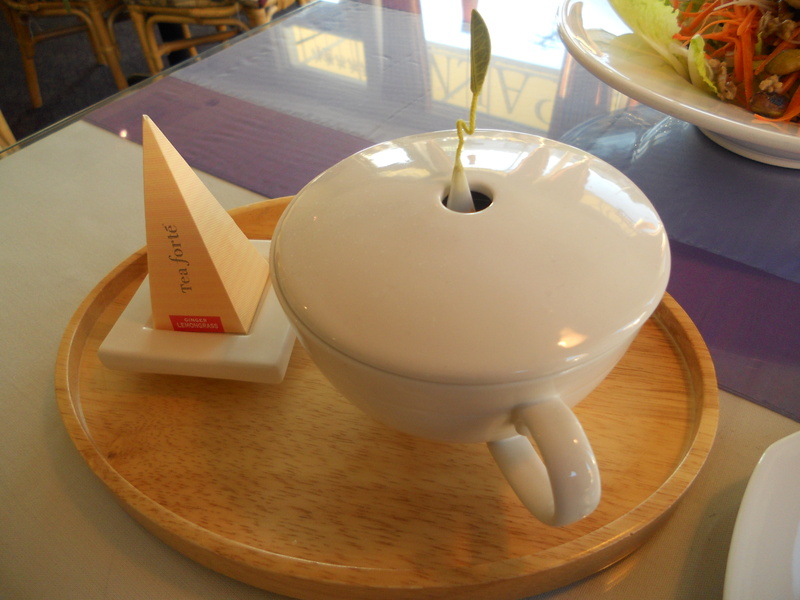 It’s the first place I’ve ever seen that serves the tea in the lidded cup especially designed to let the leaf stick out the top. SO fun. Taking the hot lid off was a bit tricky but the presentation was worth it. Isn’t that presentation great? And fine tea, too. If you have any luck finding Sir Robert’s blend, by all means let me know. It’s a tea blend from the Robert’s coffee chain in Finland, and they thus far have no means to sell outside that country. I had it when we were on a cruise (which served Forte on board!) there and it was one of the best blends I’ve ever had. Greetings Thomas. Sounds like a great cruise. And I agree that the Robert’s tea is one of the best out there. Watch for my next blog with info on how to get it in the USA! Up to now I’ve been a diehard Dammann fan as far as blends go – but this one is definitely a contender.